This bride-to-be is getting excited. And not about the big day. (Well, of course about the big day, but that’s an ever-present excitement!) But about a different day. I’m talking about the day the beau and I get to meet with our photographer and spend a couple of hours being silly and making googly eyes at one another in front of a camera. Our engagement photo shoot is just a few weeks away, and I am stoked. In the meantime, I am trying desperately to prepare. Probably the three biggest concerns of mine have been: 1) my hair 2) my teeth and 3) what to wear. In preparation for the wedding, I have been growing my hair out. You might not know it, seeing as how my hair is only shoulder length. But for reals, it’s a good bit longer than I was keeping it pre-engagement. I was opting to keep it in sort of a long bob between my ears and chin. My hair is thin and gets stringy looking when I grow it out, so shorter ‘dos definitely suit me better. 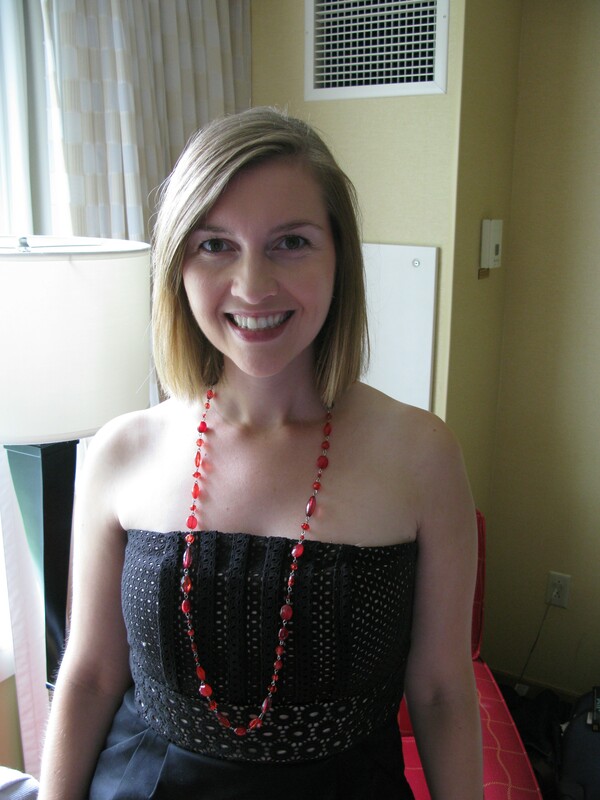 But, realizing that longer hair maximizes options for wedding hair styles, I have been growing it out. Which makes me look in the mirror every day and go “ugh!” Because it looks pretty yuck, if you ask me. So, since it looks pretty yuck, I’m definitely a little concerned about the engagement photos. Hence my decision to make an appointment at a hair salon to see about getting a body boost or a wave put in. Right now, this lackluster hair just isn’t cutting it. I gots to do something about it. So hopefully I will have pretty hair for our engagement session! The second thing I’m worried about is my teeth. I love cheesing for photos. (Seriously, you can ask anyone who knows me. I am basically one big, ginormous, walking piece of cheese.) But I have always hated the fact that my teeth have never been white. Like ever. I’m always envious of friends and strangers alike who boast pearly whites that really are pearly white. Mine are more cream. Or eggshell. Or, well, just not white. Anyway, it bothers me sometimes in photos. So, I have been using a Rembrandt whitening mouthwash twice a day in hopes of helping the situation. It seems to be helping a little, but I’m still not where I’d like to be. About a week before our photos, if my teeth are still feeling dingy, I might have to look into buying whitening trays. And thirdly, I flat out do not know what to wear. For seriousness. A dress? Cute jeans with flats? Cute jeans with boots? It doesn’t help that I have no idea what the weather is going to be like at the end of September. It could be mild and pleasant. Or it could be cold and windy. I’m thinking this might be a last-minute kind of decision. Since we got engaged, so many pieces of this big wedding-planning puzzle have fallen so easily into place. 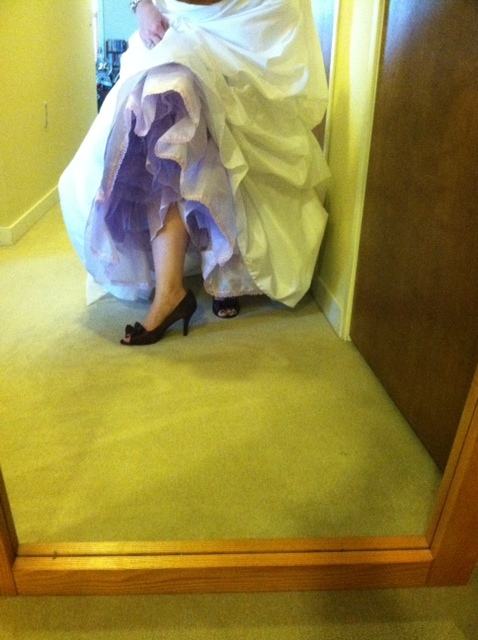 I found my dress about a month after the beau popped the question. We found our ceremony and reception venues with ease. Wedding colors seemed to fall into our laps. For all that came effortlessly, one thing remained a big fat question mark: wedding flowers. 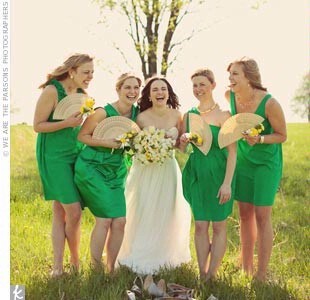 For some brides, having lots of lush flowers and greenery is a must. I began to realize it was not a priority for me. While I love, love flowers, I couldn’t imagine devoting a significant portion of our budget to flowers that would potentially have a super short shelf life. Aside from the money factor, it just didn’t feel very green to me. Granted, I’m not the most environmentally-conscious person there is, but I feel like I try. And as much as I love flowers that bloom in the park or my potted orchids, I was uncomfortable with the idea of flowers doomed to die. Once I’d made the decision that I didn’t need or want flowers that were the real deal, I began to mull over possible alternatives. And alternatives there are! It’s awesome how many other options are out there. I loved the idea of fans, spread beautifully before each girl. So, with the idea of fitting the winter theme in mind, I trudged forward. 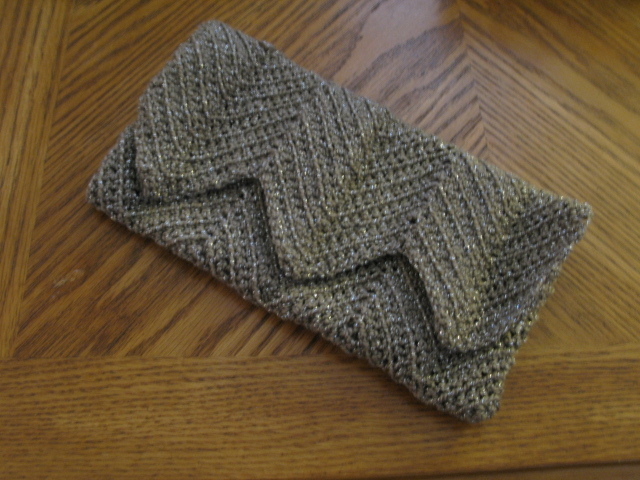 And straight into hand muffs. And for a little while, I was sold. I loved how quaint and different the idea of the muff is. 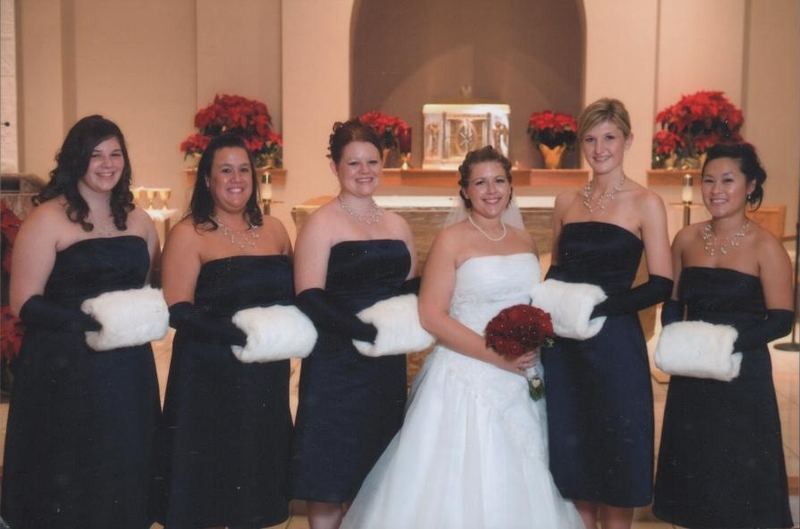 But then, slowly but surely, I stopped being in love with the idea of hand muffs. And for a time, I considered candles. As before, however, I wasn’t completely sold. 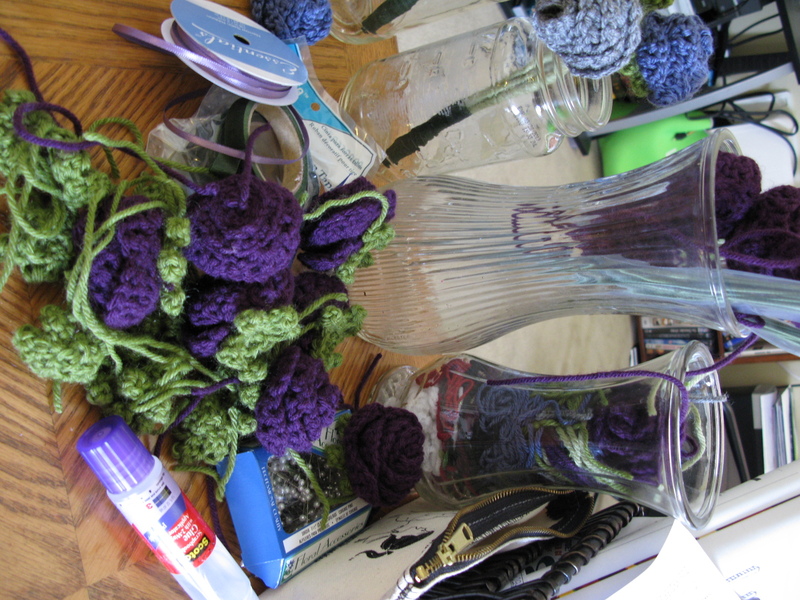 The more I thought about it, I realized I had been coming back to one idea over and over: a crochet bouquet. Now, I know this means I run the risk of people thinking I’m an old lady or just flat-out crazy, but that’s ok with me. 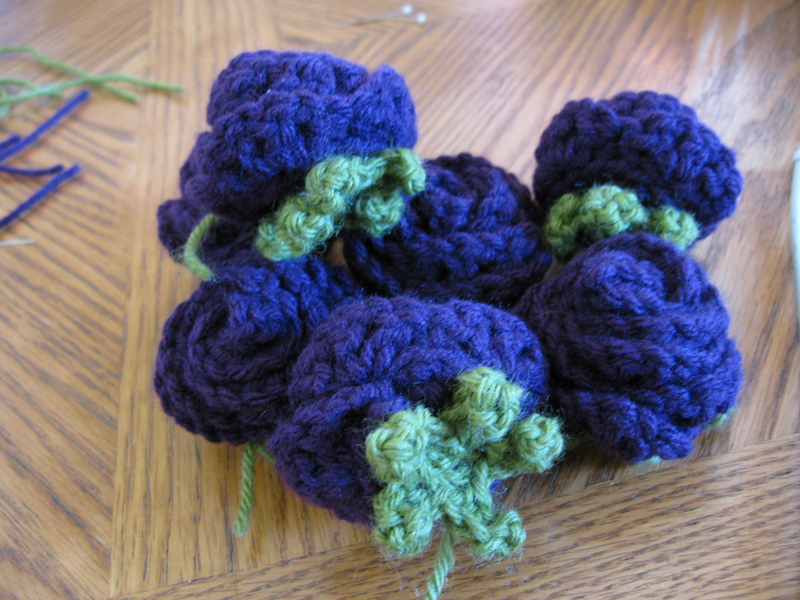 I’m pumped about the idea of flowers o’ yarn! 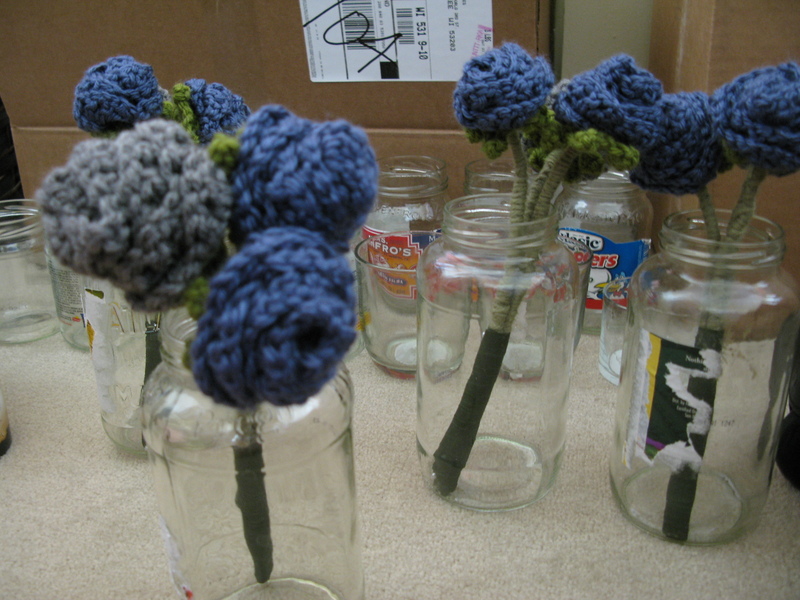 So I hit the web in search of the perfect flower to comprise my bouquets, and presto, landed on http://www.planetjune.com. 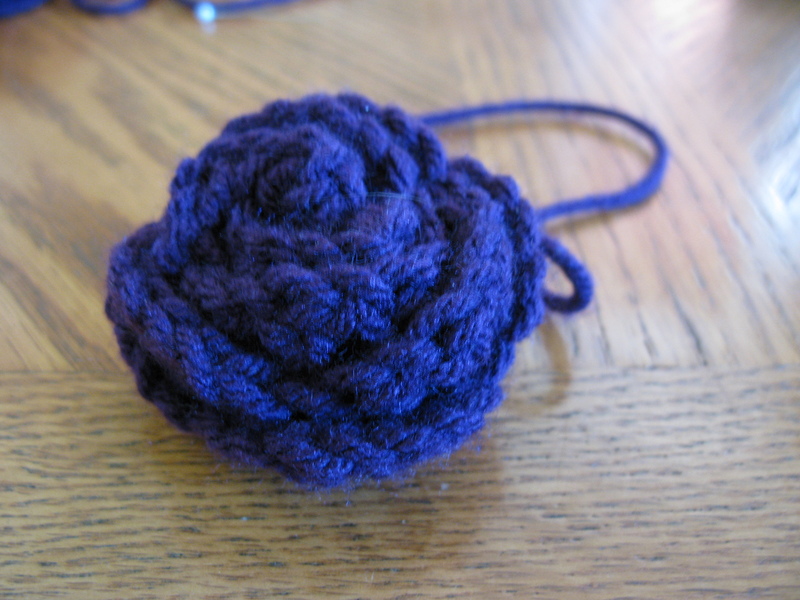 I followed the super easy instructions for the Basic Rose. 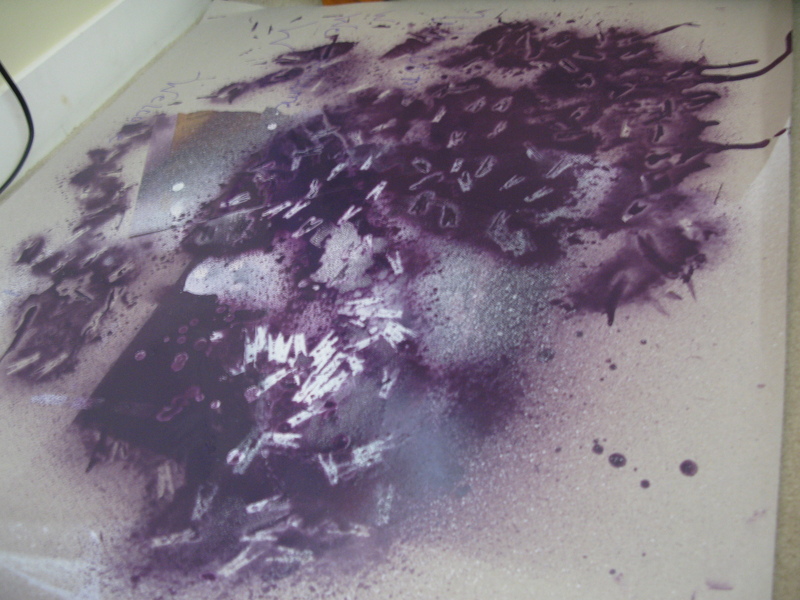 Our main color is going to be purple, with blue and silver accents. 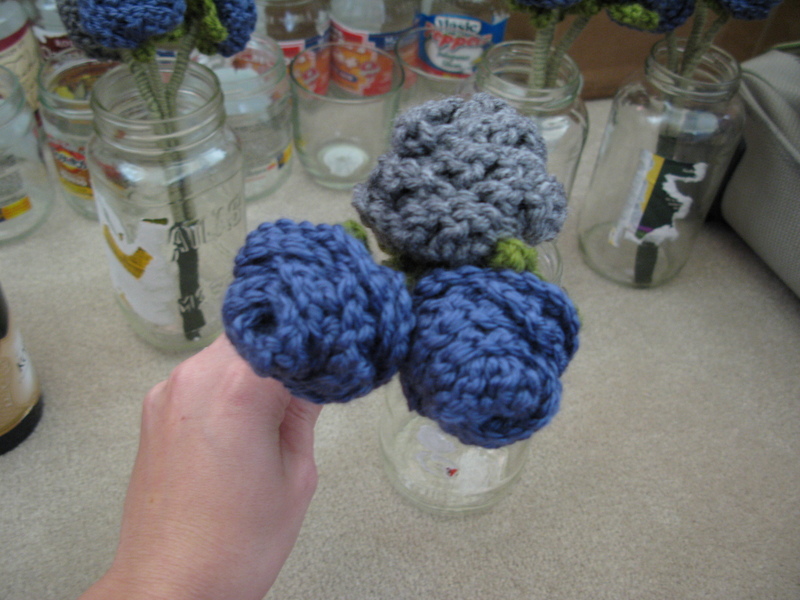 I decided to make blue and silver/gray flowers for my lovely bridesmaids to carry, while I wanted a deep purple hue. 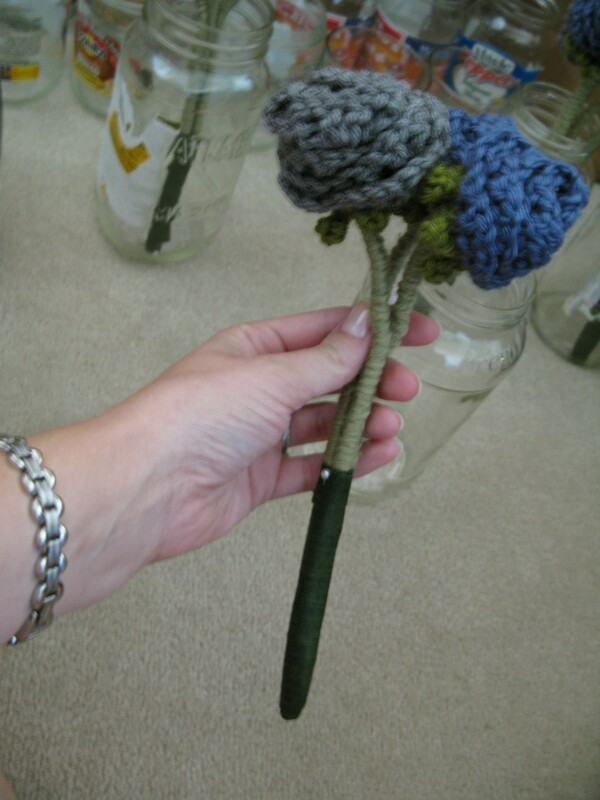 I strayed from the instructions on this site a bit when it came to making the stem for the rose. 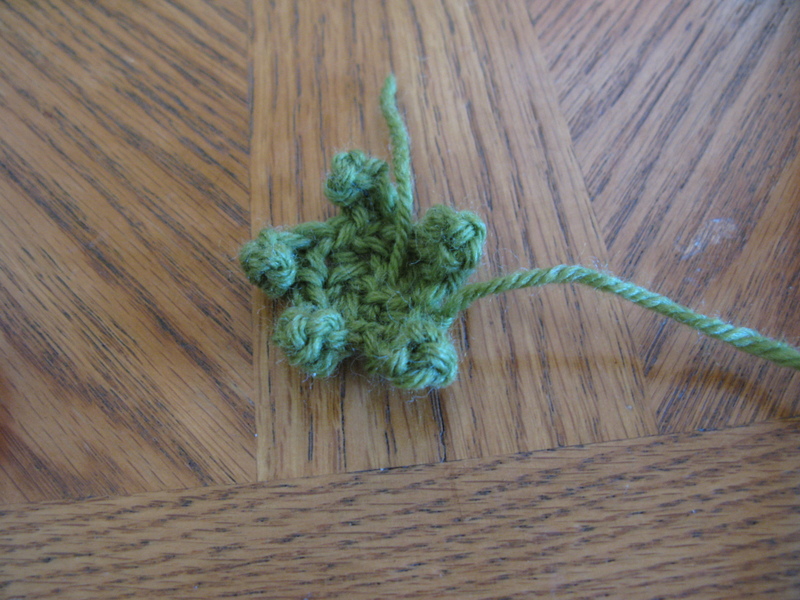 I used floral wire bent in half, to give it some thickness, and I wrapped it in green yarn several times over. 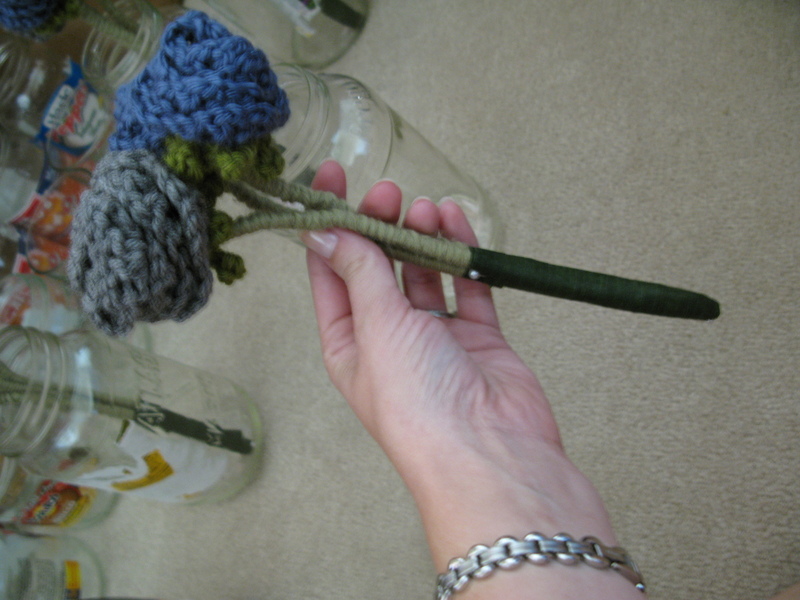 I jabbed the wire through the flowers and clamped the wire down on the inside of the flower. Then I wrapped the bottoms in green floral tape and pinned everything together with a couple of pretty floral pins! Now I just have to assemble mine! For better or worse (wait, those sound like wedding vows! 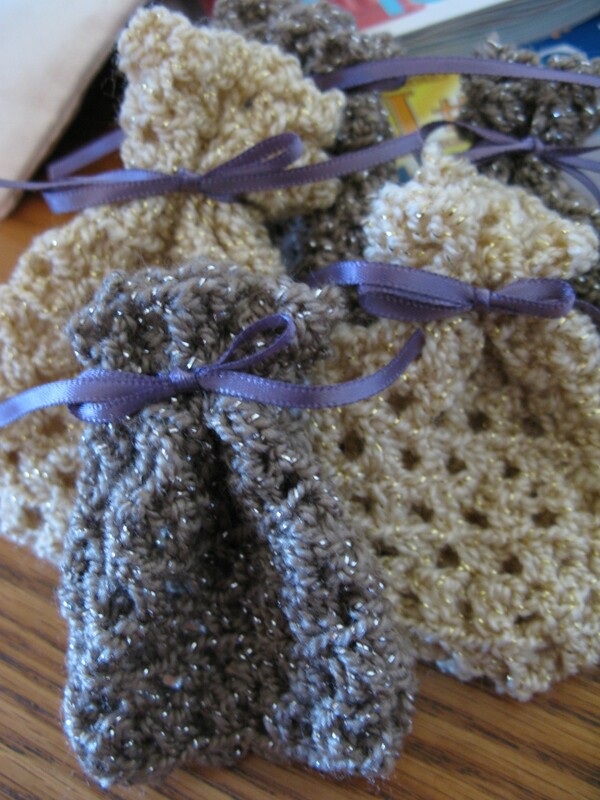 ), I have decided to crochet several different decorations and other wedding-day essentials. I know I run the risk of some people thinking I’m either super cheesy or a 97-year-old trapped in a 28-year-old’s body, but I don’t really care. 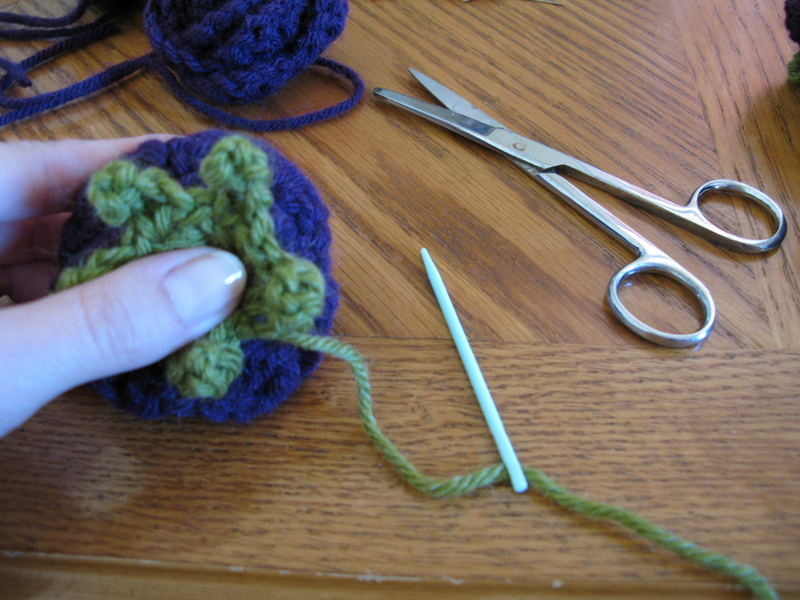 Though I have picked up a crochet hook and yarn and fiddled around from time to time for literally a decade or more (My mother can crochet anything, and I always got the bug when I watched her work. 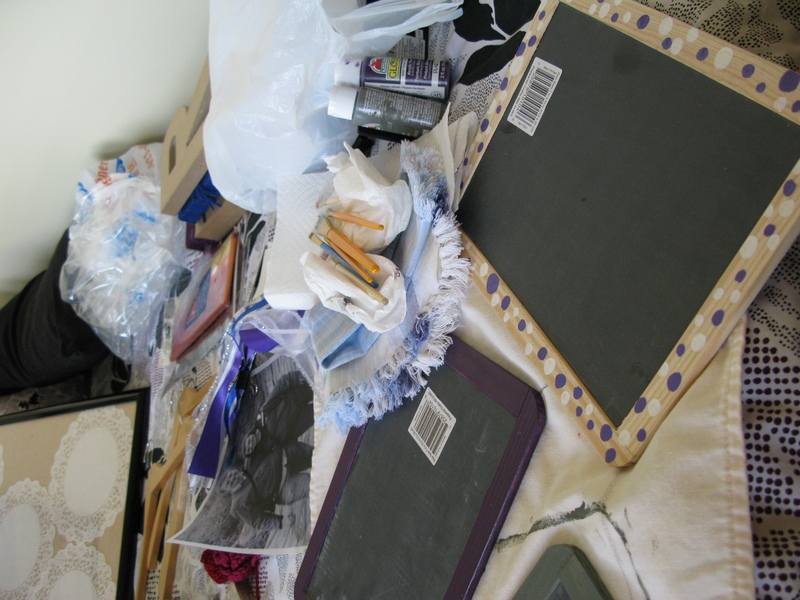 ), it wasn’t until a year ago I sat down and made myself complete a project. 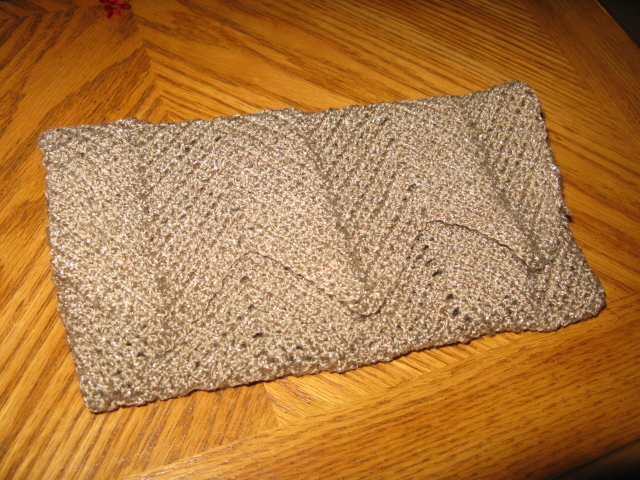 That project was a scarf. And I had so much freakin’ fun I made about 10 or 12 more. Seriously. I gave practically everyone I know a scarf for Christmas last year. 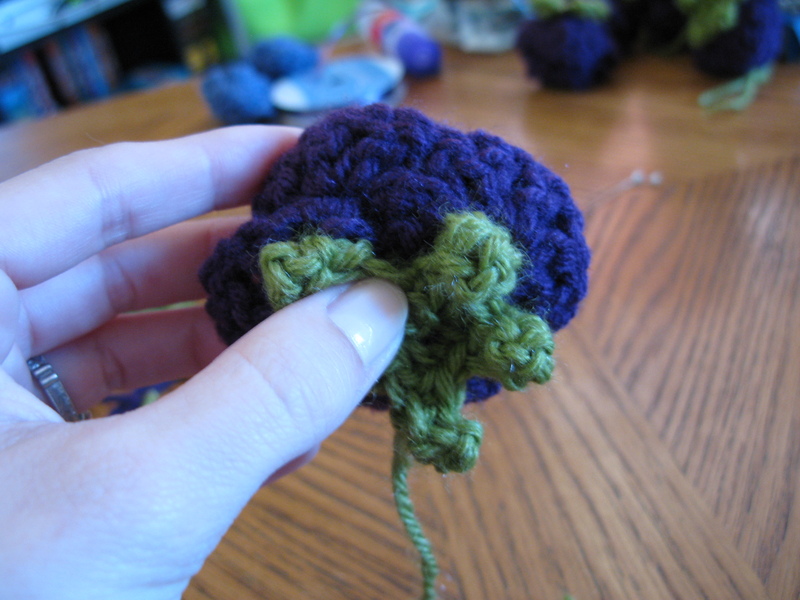 I was giddy over having conquered this new skill. 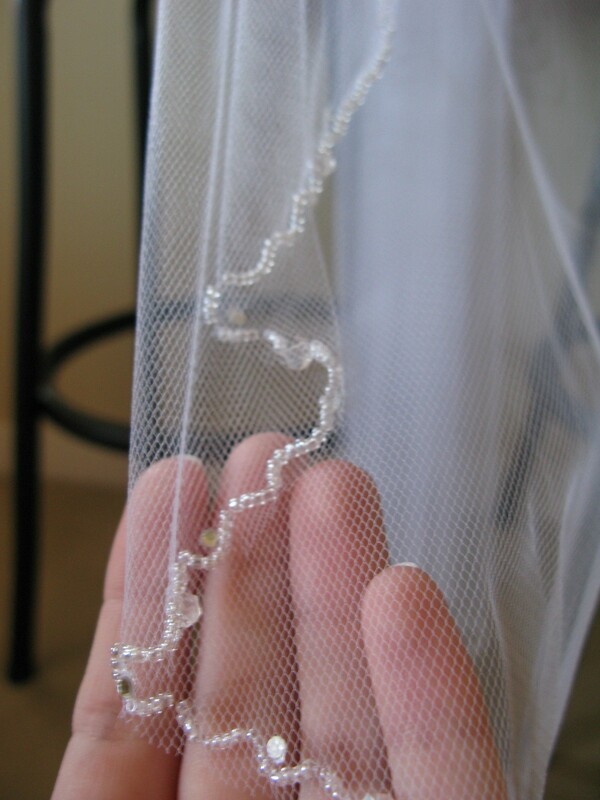 Anyway, with my newfound love for all things yarn, I decided to put my fingers to work and embark on some wedding-related projects. Those projects include: favor bags (Yes, even though you can buy multi-packs of favor bags at virtually any craft store, I decided to make my own. 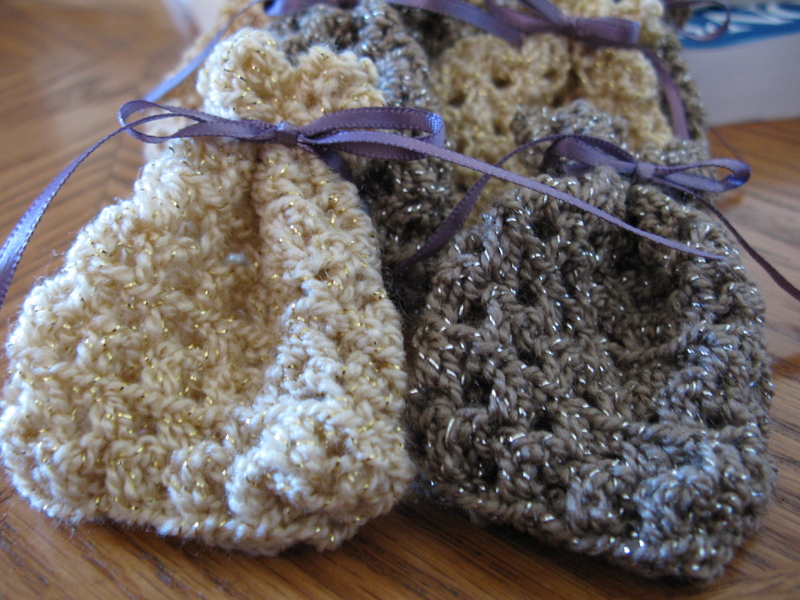 ), an evening bag for myself for the big day and an absolutely adorable Amigurumi (a type of stuffed crochet toy or object) bride and groom in the form of two peas in a pod that I’ll share more about later. 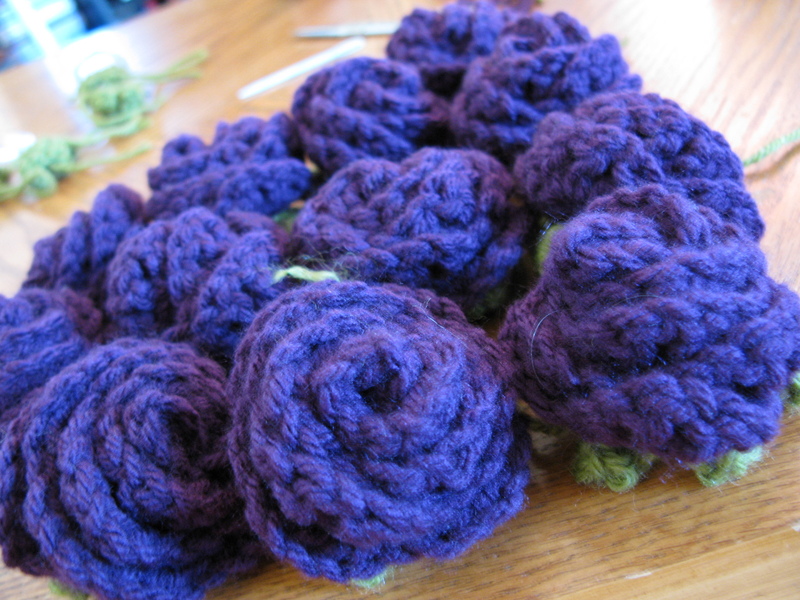 And, perhaps more important than anything else, I decided to crochet my and my bridesmaid’s bouquets. Call me crazy, but after struggling for months to decide what to carry and getting nowhere, it seemed like the perfect solution. Like all brides, I want to look beautiful on my wedding day. But more than that, I want to look special, unique. Thankfully, there are oodles of ways to personalize a wedding-day look. There’s the style of the dress, the jewelry, the shoes, the hair – and of course, what you put in/on your hair! 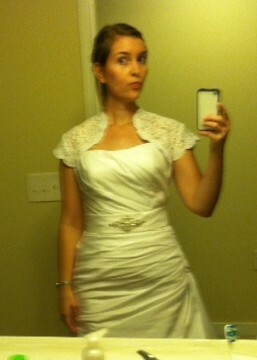 I’ve been excited in recent weeks to see my wedding-day ensemble come together. I’ve had my dress from pretty early on in this process, and it’s been sort of like working at a canvas with a palette in hand, adding touches of color and pizzazz here and there. The first big accessories were the headpieces, which I am super stoked about. (*Spoiler Alert*: Go away, hubby-to-be if you are reading this!) 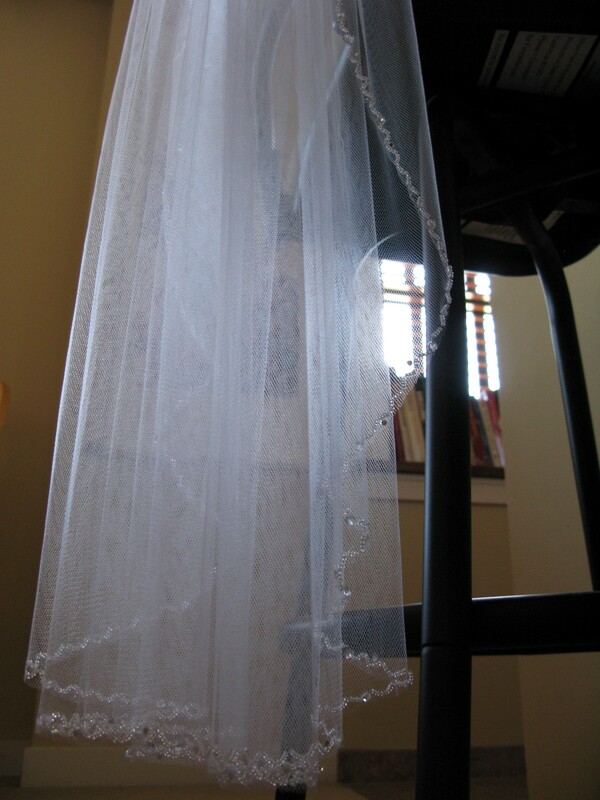 When I purchased my dress, I also bought a lovely, simple veil. I love it because it’s really elegant and really minimalistic. It’s the kind that’s attached to a little comb you just stick into your hair at the back of your head and let it cascade down your back a bit. And, my most favorite part of all: a tiara! I have long had an infatuation with the bejeweled, bedazzled headpiece that is the tiara. Way before the newest royalty in Great Britain stole our hearts with her vintage wedding-day look that included a tiara sparkly and sophisticated enough for a princess, I have loved how beautiful these miniature crowns can be. Now, I just need to figure out what the heck to do about my hair and makeup and we’ll just about have a legitimate wedding look created! 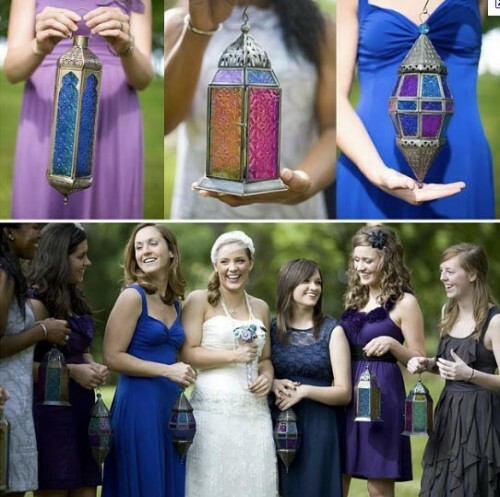 After trying to think of ways to customize my wedding-day look, I was ecstatic when I came across a few deliciously colorful photos in the web-o-sphere of brides who decided to wear colored crinolines beneath their dresses. It was love at first sight. I absolutely loved the fun pop of color these wardrobe pieces provided. And I also loved the wide range of uses of the colored crinoline; some brides went for all-out, super vibrant color, while others opted for subtle hues of pinks or blues that gave just a slight nod to the whimsical. I decided I had to give it a go. What better way to continue to pay homage to my personal favorite color *purple* and the weaving in of the color into my wedding day? I read several helpful how-to guides for dying using the magical color changer RIT dye and weighed the pros and cons of using powdered dye (more concentrated but there’s less of it) over liquid dye (less likely to dye as darkly as you might want but there’s more of it). I opted for liquid dye. I also opted for the ease of washing-machine dying. It required running hot water, detergent and bleach through the machine a time or two afterward to clean it out, but I figured it was a safer bet than potentially ruining a sink or a bathtub in my apartment. 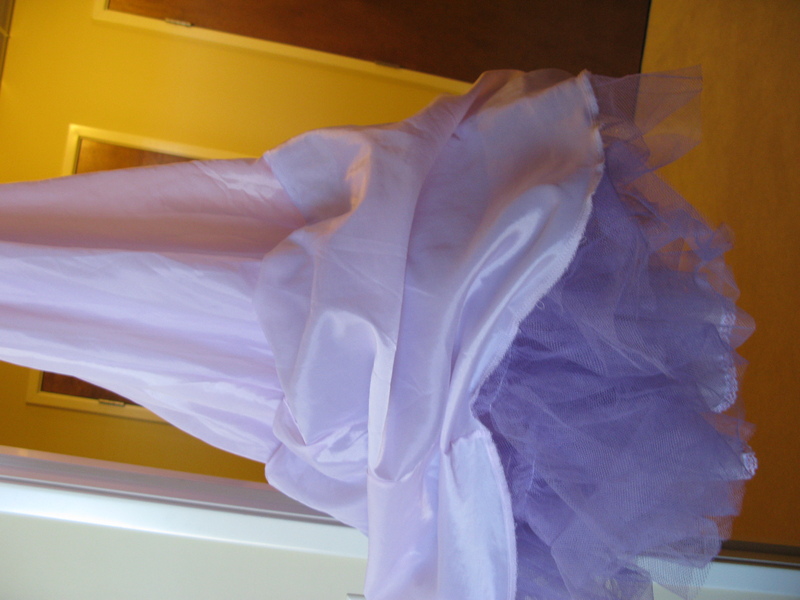 So, with bottle of liquid dye in hand, I stuffed the layers of poofy crinoline I had purchased from Amazon into the hot pool of purple water in the washing machine and ran it for about 30 minutes. The results were so-so. 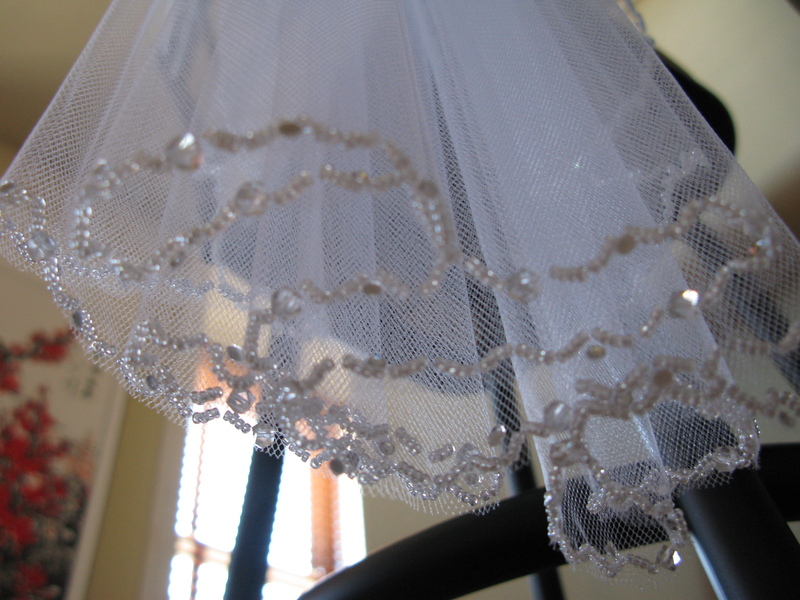 The tulle part (the fun part!) is a lovely light purple. 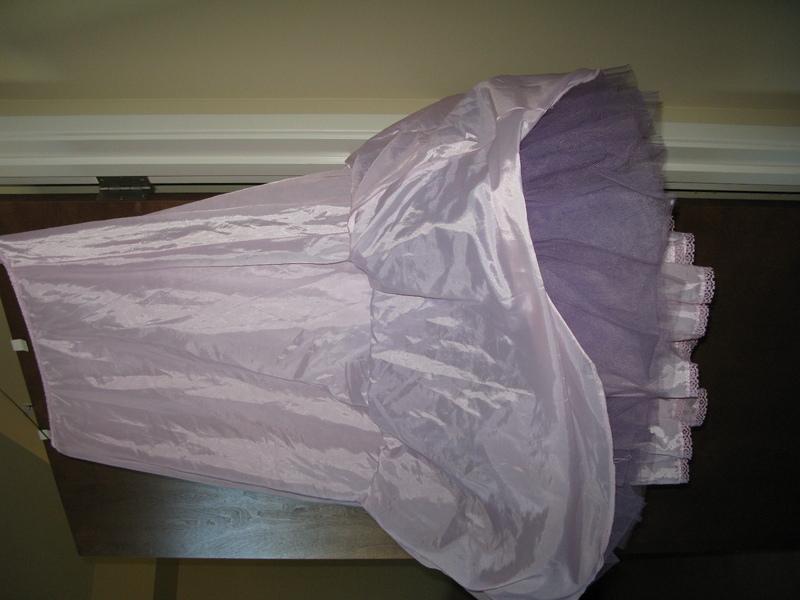 However, the rest of the crinoline came out a cotton-candy shade of pink. Whoops. 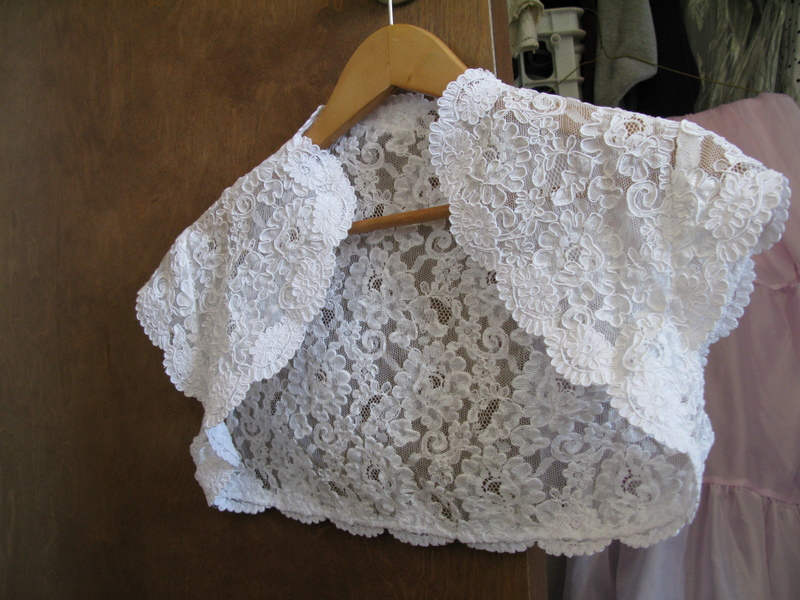 I had worried that might happen, as I had read that polyester doesn’t dye particularly well and I really had a hard time finding a crinoline that wasn’t polyester. So now I am left trying to decide whether it’s worth re-dying or going the more dangerous route of cutting the fabric away from the tulle since that’s the part I care the most about anyway.